I first became aware of the existence of the University of Naples Department of Veterinary Medicine when little Mickey, the mutt pet of my friends Charley and Jeanne (yes, the very same pooch that locked me out of the house!) was attacked and almost devoured by a very nasty Boxer (who, I hope, is by now vainly woofing after uncatchable hub-caps of fire in hell). We got Mickey into the hospital in Naples where he was x-rayed, treated and handled gently and wonderfully by a cadre largely composed of young women studying veterinary medicine and who coddled and soothed the little guy such that I was almost looking forward to being run over, myself, and coming back as a dog. The x-rays showed his little bones to be broken like a chicken's in various places, but he made it. The idea of a school for Veterinary Medicine in Naples goes back to the late 1700s under Ferdinand IV. The first site was near the Maddalena bridge (in back of where the central train station is now located). The school started taking students in 1798. Their primary mission was to take care of the horses in the royal cavalry. 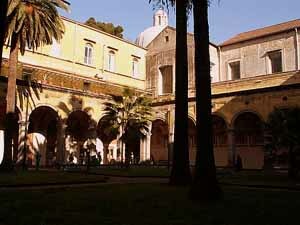 The school had its up and downs during the two periods of Bourbon exile (in 1799 and 1806-15), but was relocated under the latter period to the premises of the expropriated monastery of Santa Maria degli Angeli alle Croci (photo, right), adjacent to the Botanical Gardens, one block north of via Foria. It started thriving in the 1830s under the direction of Ferdinando De Nanzio, a respected scientist throughout Europe, whose mission was to start caring for all animals useful to man and not just the royal horses. The school was put under the auspices of the Ministry of Agriculture in 1848 and incorporated into the general university system of united Italy in 1861. Currently there are about 600 students following the five-year curriculum that leads to a degree in veterinary medicine. Their daily routine outside of the classroom, predictably, has much to with pet dogs and cats with an occasional bunny, hamster and exotic bird thrown in. Yet, there is a department for "large animals," including farm animals, horses from the large race track and many stables in Naples, and even a panther from the zoo. If Jumbo is ill, this is the place to bring him (although for an elephant, the vet will certainly make a house-call). The adjacent church Santa Maria degli Angeli alle Croci (photo, left) has remained open all these years and is a very historic church in a city full of historic churches. 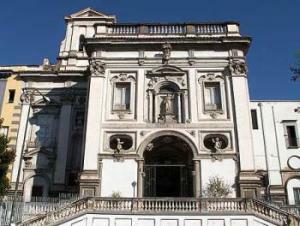 It was built in 1581 as a Franciscan monastery and a significant amount of the design is the work of Cosimo Fanzago (1591-1678), the unchallenged king of 17th-century Neapolitan architecture, a tiny sampling of whose work in Naples, alone, can be seen in the churches of S.Maria la Nova; Saints Severino and Sossio, S. Maria di Costantinopoli, San Pietro a Maiella (now the music conservatory) and San Domenico Maggiore.